Elliot Miller's "The Odd Faith Out"
I haven't been by for a while, and last time I was here I explained a bit about why. In April 2018, a dear friend of mine passed away: Elliot Miller, editor in chief of the Christian Research Journal. 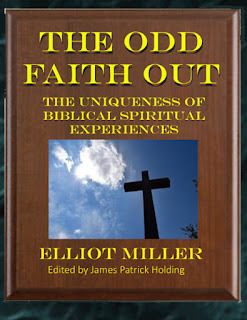 In the wake of his passing, I was asked by his wife to take up the completion of a project he did not finish -- a book on spirituality with the title The Odd Faith Out. By "completion" I don't mean I did any writing or original research. The book was a work in progress, and Elliot left behind some notes and ideas for how he planned to complete it. His plan called for a book three times the size of what was in the manuscript. All I did was add a few easing transitional phrases between sections and write a brief foreword. The rest is pretty much as Elliot left it. I am taking a couple of weeks off for action, I need to know people are reading this blog please let me me hear from you. If you want this blog to continue. Let's remember in part 1 established that the christian walk is both an individual relationship with God 1x1 and membership in a body of Christ. This is not a contradiction because it is a body, a collective made up of individuals who have personal relationships with God. The idea that we only have a relationship with the church can be a big excuse not to do what we know is right but to use membership in the group to shield us from personal responsibility. Of course it can also be used by the leader of the group to take control of the lives of individuals and abuse power. Here’s the thing:Christianity is not about a personal relationship with Jesus. The phrase is never found in the Bible. And the whole biblical witness runs contrary to it.Our life with Christ is communal, not personal or private or individual. When the Scriptures speak of believers, they are part of a community, a fellowship of other believers. *Christianity is not about a personal relationship with Jesus.The phrase is never found in the Bible. On Metacrock's blog I put up a post for two atheists I had challenged on You Tube,I am still awaiting their arrival. Old Skepie could not resist the urge to argue with me just one more time. He feels it's time for me to give him another debate lesson. I want the space on my blog clear for those I challenged so I'm moving the debate with Skep here. I will summaries the two arguments. (1) The affects and effects of mystical experience are real in that they are measurably transformative in a positive sense. (2)These affects cannot be reduced to naturalistic cause and affect, bogus mental states or epiphenomena. (3)Since the affects of Mystical consciousness are independent of other explanations and the affects are real we should assume that they are genuine experiences of something transcendent of our own minds.